Visiting a church for the first time can be very intimidating: Will I fit in? What should I wear? What kind of music will they play? Where do I park? What should I do with my kids? The fact is, it is never easy visiting a church for the first time. First Broad Street is a place where you don't need to worry about these things, because there is a great place for you to fit in and feel comfortable. We have a Sunday morning service for you! Whether you appreciate an organ and choir, or you appreciate guitars and drums, we have worship that is tailored to meet every need. We do our very best to create an environment where you will feel the presence of God and you will be able to grow in your faith. We encourage you to dress in whatever makes you feel comfortable. Many people in our traditional services in the Sanctuary are "dressier" than those in our Encounter service in the Fellowship Hall. We sum it up this way- "Don't stress about dress!" Located in the heart of Northeast Tennessee, First Broad Street United Methodist Church is located in the city of Kingsport on the historic downtown Church Circle. Since we are a downtown church, parking can be difficult at times. So we have tried to make it as easy as possible. 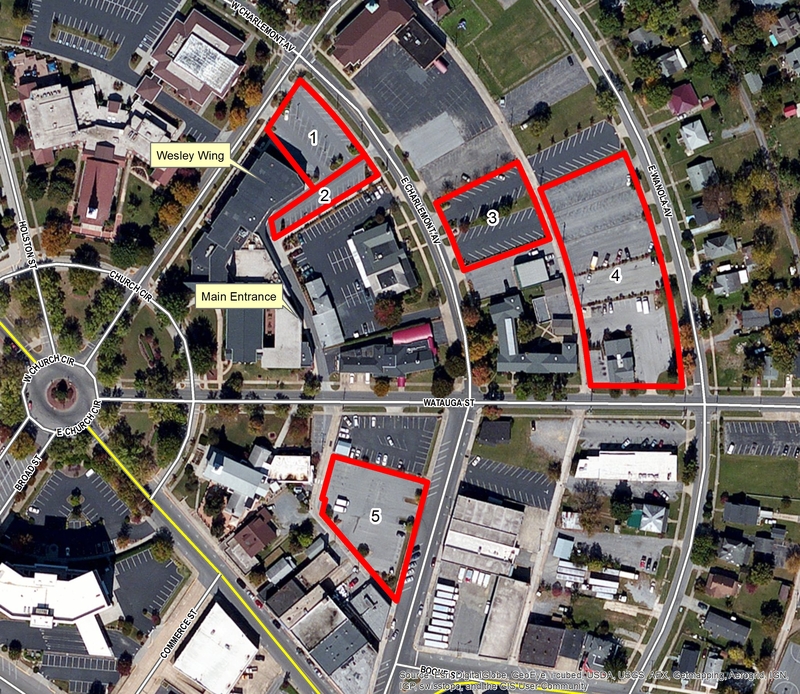 Simply stated, parking is mostly behind our two church buildings, which are the furthest two right buildings on Church Circle. There are two main entrances to our church. Our Main Entrance through the glass doors leading to the sanctuary- these doors are located directly behind Hamlett-Dobson parking lot. Or you can enter through the Wesley Wing entrance, which is the closest entrance to the intersection of Broad Street and Charlemont. Walking underneath the overhang, these doors will give you access to our children's check-in system. This 35-space parking lot is the closest to the education and worship buildings. There are 21 open spaces, seven spaces reserved for the handicapped, and seven reserved for special needs (e.g., families with young children, senior adults). This row of 15 parking spaces includes four spaces reserved for visitors and 11 spaces reserved for those with special needs (e.g., families with young children, senior adults). This is a large parking lot with parking along the street available as well. To enter the main church building walk toward the church building through the alley way (crossing Watauga St.). TO HELP PEOPLE FOLLOW JESUS BY LOVING GOD, GROWING TOGETHER, AND REACHING OUT. First Broad Street United Methodist Church is a community of Christian faith located on Church Circle in downtown Kingsport, TN. Whether you have been a Christian all your life and are looking for a place to live and grow as a disciple of Jesus Christ, or you have never been in a church before and are curious about who Jesus is and what being a Christian is all about, there is a place for you at First Broad Street to journey in faith by Loving God, Growing Together, and Reaching Out. Experiencing God- We seek to offer ways to grow deeper with God. Powerful Worship- We seek to provide opportunities for God to inspire powerful worship. Healthy Marriages- We seek to enable couples to have God-centered relationships. Strong Families- We seek to guide families as they raise children to follow Christ in a changing world. Sharing Life- We seek to be an inclusive and diverse Christ-centered community that values intergenerational relationships. Faith in Action- We seek to share Christ's love through speech and service. Enhancing ministry through local missions by. . . Reaching at risk children – increasing support and contact through the Childcare Center, Jackson School, Camp Bays Mt.